I know it certainly applies to me, but, I have a solution, the Bernina 780 Sewing Machine! It has a larger bobbin capacity, up to 80% which can make a huge difference, especially when quilting. Of course, that’s not all this Bernina model has going for it with its USB Connection, Bernina Stitch Regulator (BSR) and the Bernina 9 Hook. Let’s take a closer look at this sewing machine from Bernina, well known for producing quality machines. 60 Day Money Back Guarantee and Payment Terms Available! So not only does the Bernina 780 have the extra large bobbin going for it, it’s also a great price from Sewing Machines Plus (for now)! 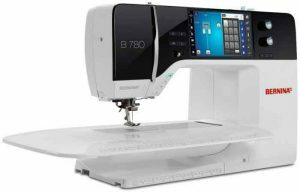 At first glance, the Bernina 780 sewing machine is sleek, great looking sewing machine that has a large full-color LCD touch display screen. 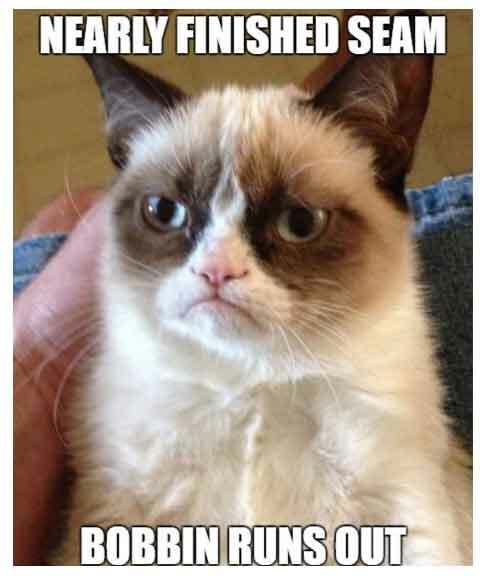 With the Bernina 7 series comes the new Bernina 9 hook (patent pending). It sews up to 9mm width and has a speed of up to 1000 stitches a minute. As mentioned before the bobbin has 80% more capacity for the thread, great for quilting and sewing long seams. 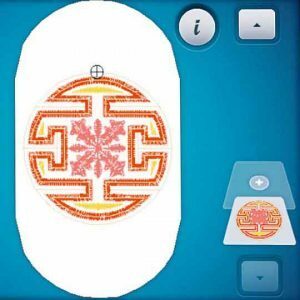 Total stitch control – Whether altering the stitch length, stitch width, needle position or creating combinations, your stitches are remembered. 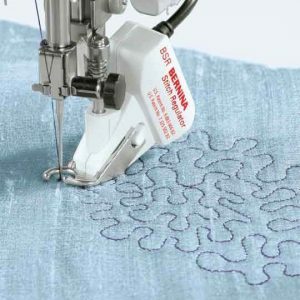 The BERNINA Stitch Regulator (BSR) – The BSR foot provides high-speed free-motion stitching assistance with both straight and zigzag stitch options and it comes standard with the machine. Dual Feed – Optimum visibility and great fabric feed. The dual feed makes it easy to manage fabrics. Easy to engage when needed, the BERNINA Dual Feed tucks completely out of the way when it’s not. On board tutorial – this is a great feature. You can ask questions anytime directly on the screen and there are also tutorials. This is particularly useful if you’ve never had a sewing machine as sophisticated as this before. 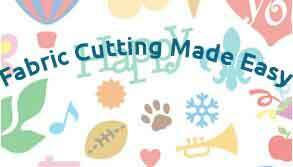 Word Art – A great feature for personalizing anything you create. 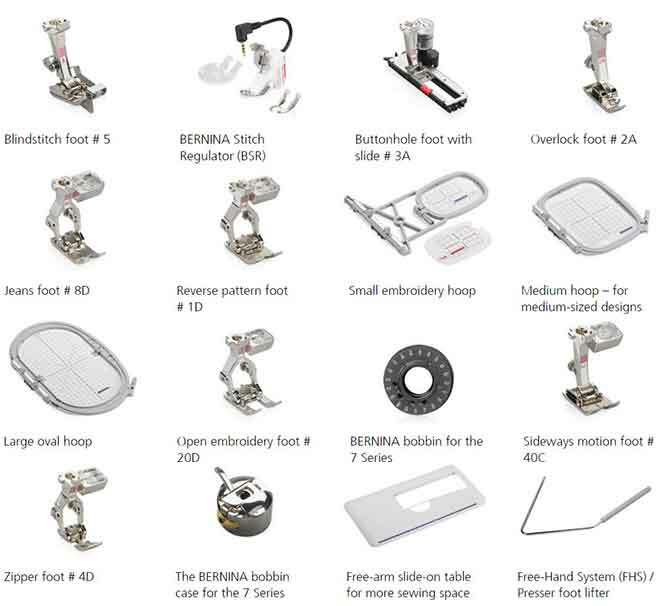 As you would expect, the Bernina 780 sewing machine comes with some pretty useful extras. All the feet are metal, not the horrible cheap plastic you get with some sewing machines. There is a slide on table for accommodating larger projects and a very useful overlock foot. I love the way Bernina has their own YouTube channel, this really lets you see Bernina sewing machines in action. Here you can see the dual feed foot in action, I love the way it tucks neatly into the back of the machine! This is a sophisticated sewing machine and normally I would say not really suitable for beginners. However, with the onboard tutorials and plethora of YouTube videos I’m pretty sure it wouldn’t take too long to master the Bernina 780. It sews a beautiful neat stitch no matter what type of stitch design you create. The quality of the LED lighting is impressive. The positioning of the lights eliminates shadows and gives the brightest possible light on the work space, very easy on tired eyes that have been sewing for hours! It has a front loading bobbin with a window above the bobbin housing which should make changing the bobbin easy. Unless you’ve got small hands, changing the bobbin without removing the work table might be a challenge. 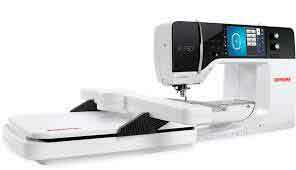 The Bernina 780 will sew through most fabrics and multiple layers with ease. It’s not so good with reptile skin, fur and leather but I don’t really see quilters and embroiderers using this type of fabric! Difficult to change bobbin without removing the table. Quality build and presser feet. Dual feed tucks away neatly inside the machine when not in use. I can’t really find many negative things to say about the Bernina 780. It’s everything you would expect from a class act like Bernina right through to the quality presser feet. You’ll be hard pushed to find a better deal than this with 0% finance available if needed.